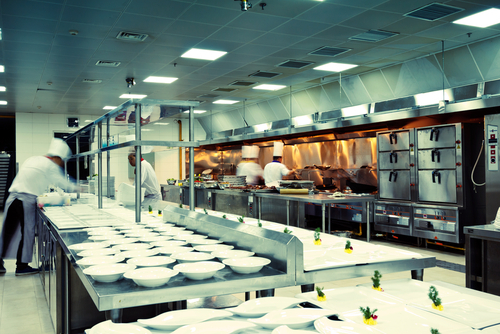 In a hotel kitchen, food must often be prepared in large quantities to satisfy a large number of hungry guests. If you are wondering how to effectively prepare food for a crowd, these helpful tips will make the job a little easier. One way to save money on the food prepared in your hotel kitchen is to purchase food products in bulk. When purchasing large quantities of various food items, you will be able to purchase the food at a much more cost-effective rate. Once you have purchased these bulk foods, it is important to store them correctly to prevent spoilage. Ensure that each type of food is kept at its ideal temperature, at the proper light and moisture level, in order to prevent premature spoiling. As with any food establishment, the safety of your hotel's guests needs to be your first and foremost priority. When cooking large quantities of food for a large number of guests, the safety of the food you are preparing becomes paramount. Therefore it is crucial to ensure that all food is cooked thoroughly. If, for example, you are preparing chicken breasts for your guests, it is not enough to simply check that one breast has finished cooking. Because of problems with heat distribution or uneven ovens, it is necessary to use a meat thermometer to check every individual breast for doneness. Paying careful attention to safety standards in a hotel kitchen is the only way to safely prepare food in large quantities. When cooking large quantities, the cooking time may need to be adjusted to ensure doneness. It is also advisable to use a convection oven, which uses air circulation to distribute heat evenly throughout the oven, thus preventing some food from cooking more quickly than other food. Often, the quantities used for a family recipe cannot simply be multiplied by a specific factor to generate a workable recipe for a large crowd. For example, the amount of fat required in a recipe often decreases proportionately to the serving number of a dish. Cooking is an exercise in chemistry, which is why it is recommended to use recipes that have been designed and developed for large quantity cooking. When you use recipes that are specifically intended for large batches, you will improve the chances of achieving the right consistency, flavor, and temperature in the final product. Cooking for the guests at your hotel can be quite a challenge. Allowing guests to choose from a complex dinner menu will create a great deal of work for your chef and kitchen staff. If, on the other hand, you create a menu that will be served to all guests, the workload will decrease substantially. For this to be feasible, however, cooking methods will need to be adjusted in order to prepare large quantities of a specific dish. You must also buy food in bulk and store it correctly; adjust cooking times and heat distribution methods; ensure that food is cooked thoroughly; and use recipes that have been specifically developed for large quantity cooking. All this will improve the quality of the meals you prepare for your hotel guests.